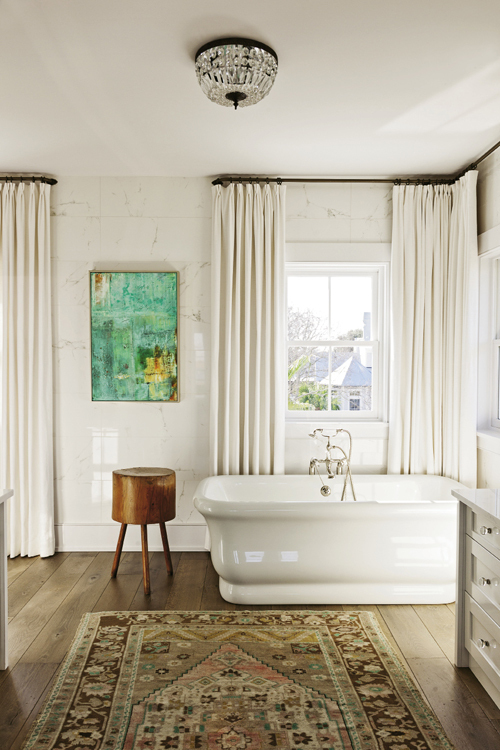 Suite Views: A piazza off the couple’s bedroom overlooks the marsh, while the windows in their bath offer harbor views. 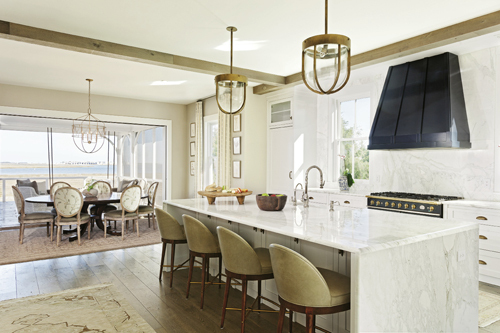 Scenic Living: Retractable doors in the kitchen and dining areas allow the adjacent rooms to function as one 800-square-foot indoor/outdoor living space. 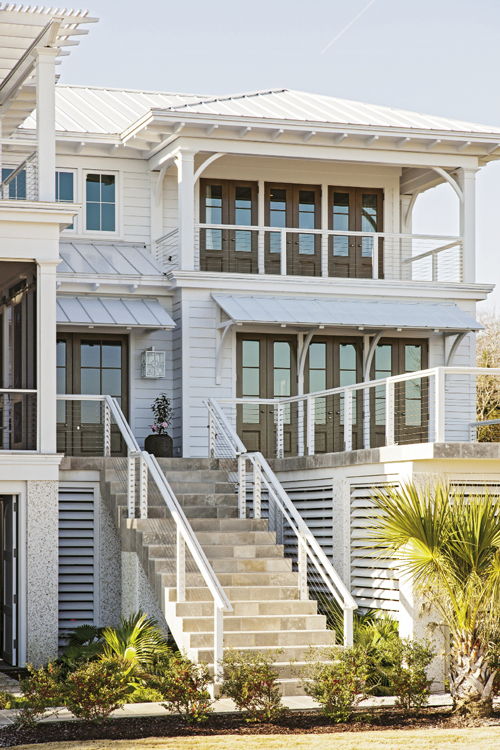 Scenic Living: This front porch looks out on the view that first captured the owners’ hearts. 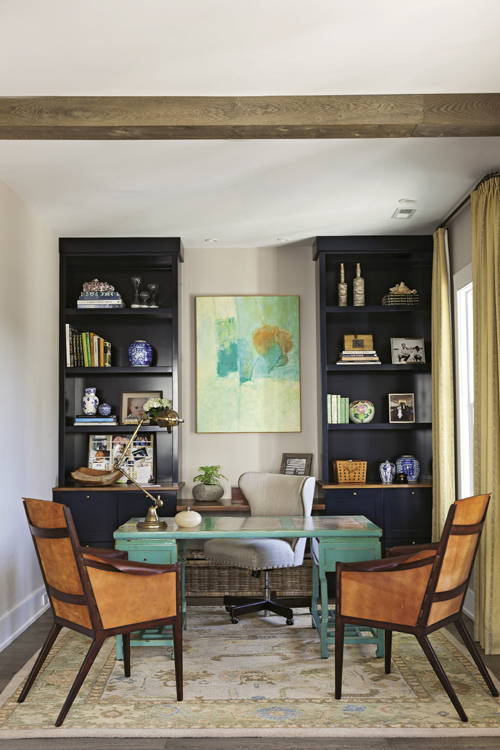 Office Space: Navy bookshelves of Bishop’s own design provide practical storage in the home office; a painting by an unknown artist inspired the nook’s turquoise and orange palette. Modern Romance: The homeowners’ clean-lined aesthetic, seen in the geometric patterns of the iron stair rails, is tempered by pieces that exude Old-World charm, like this floral chaise lounge. 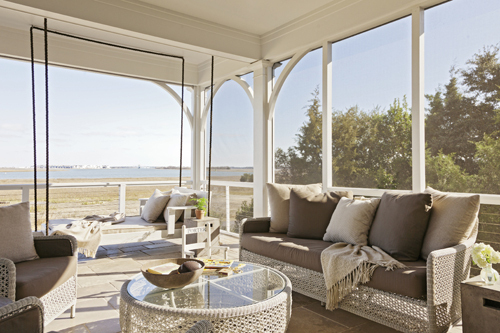 Windows to the Soul: Glass panels and porches galore bring the landscape indoors. 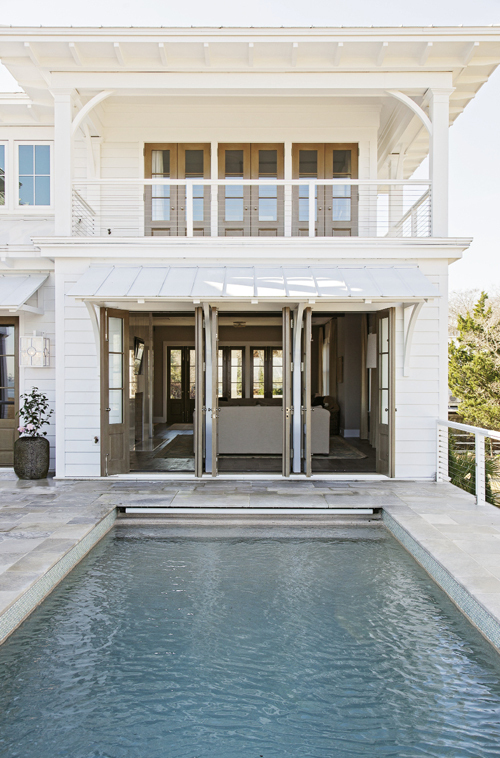 In the Swim: A wading pool graces one of four front porches; in the rear. 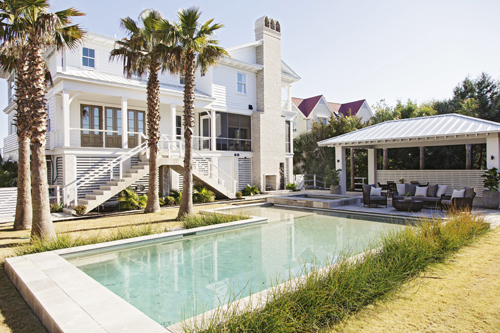 Party Time: A pool, jacuzzi, and cabana make the backyard party-ready. 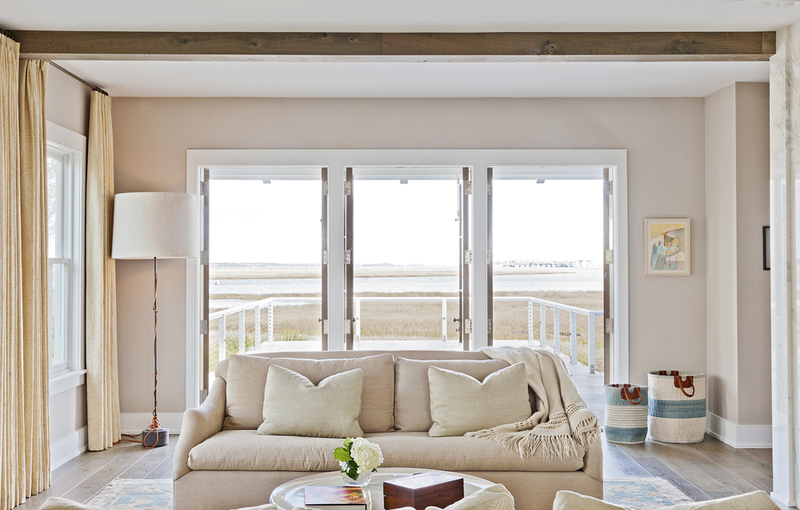 A few years ago, on the west side of Sullivan’s Island, a young family fell in love with a particularly gorgeous view—and it was more than just a passing romance. The longtime island dwellers were seriously smitten with a stretch of wetland first glimpsed from the front porch of a friend’s house. On each return visit, they fell deeper for this singular slice of marsh and sky, with its earthy palette of greens, browns, and blues occasionally shot through with the neon hues of the sunrise. In the distance, they could see the Ben Sawyer Bridge ushering folks from the bustle of Mount Pleasant to a more relaxed place where the pace is slower and the beach is never far. “There’s something about that bridge that makes time stop, even in the middle of a Monday,” muses the wife and mother, who’s also a marriage and family therapist. The couple was so besotted by the whole tableau that, along with their three-year-old son and newborn daughter, they eventually moved a matter of blocks to make its captivating beauty the backdrop of their everyday lives. Cortney Bishop to help bring their ideas to life. The partnership with Bishop was a no-brainer, as the duo first hired her back in 2008 to refresh their previous residence, a classic cottage nearby. “The process we took with the first home was so vital to this second project, because the clients had spent the time honing in on what they liked and refining their personal style,” Bishop says. As a result, the couple already had a firm grasp on their desired aesthetic, which Bishop describes as “elegant and clean, with romantic, Old-World details.” They used this knowledge to guide Dungo towards blueprinting a 4,500-square-foot house that’s organic with a modern edge. And there is something decidedly contemporary about the space throughout, from the geometric patterns embedded in the entryway’s iron staircase to the white marble accent walls and the use of sculptural light fixtures that feel like pieces of modern art. “I love how Oliver didn’t use crown molding, and there aren’t any shiplap walls—it feels newer and fresher than the typical Sullivan’s home,” the husband and father adds. But all that modernity is balanced by natural details such as wide-plank French oak floors and exposed wooden ceiling beams, which both work to maintain a sense of warmth. That sense of airiness is another thing that sets this domicile apart. “Most Sullivan’s houses, you’ve got this bedroom here and that bedroom tucked over there, and the ceiling is sloped because of the gabled roof,” says the husband. By comparison, this floor plan is refreshingly uncluttered. On the first level, the open layout makes room for wide, clear pathways. And on the second floor, the roof’s more relaxed pitch allows for 10-foot ceilings, and the bedrooms are arranged in a logical row. “The rooms flow nicely, and it’s just so efficient,” he adds. Furnishings and accessories maintain the careful balance between Old-World romance and of-the-moment freshness. In the foyer, a feminine floral chaise lounge tempers a graphic gallery wall populated by black-and-white family photos and navy-and-white figures painted by area artist Lynne Hamontree. Glass chandeliers, crystal knobs, and an antique oriental rug bring vintage flair to the otherwise sleek master bath. 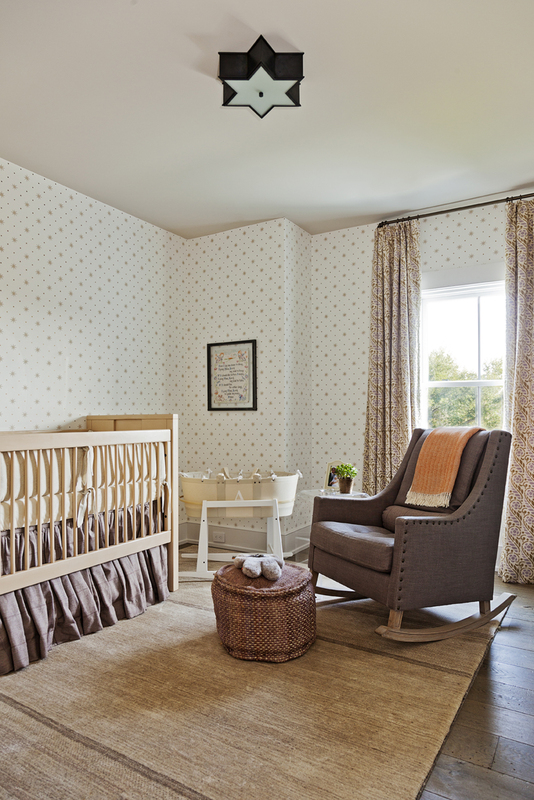 Nods to the scenic setting are threaded throughout, from the green grasscloth wallpaper that wraps the master bedroom to the tobacco-stick fixture that lights up the three-year-old boy’s bedroom. “It’s bringing in the colors of the marsh landscape, the blues and greens and browns and creams,” Bishop says. With this palette in place, the interiors complement, rather than compete with, the views. 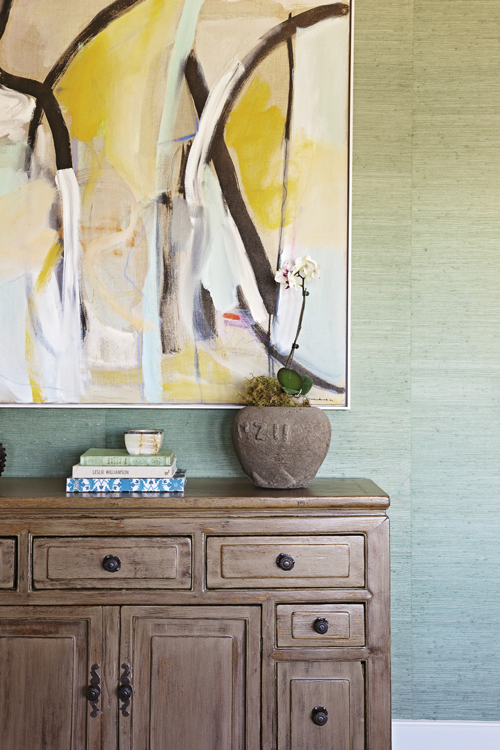 And in keeping with this approach, one of the most eye-catching pieces in the owners’ art collection—an abstract painting by Tim Hussey—hangs in the foyer, one of few areas without any windows.